A Slice of Smith Life: Happy New Year with Mary and Epiphany! In the Catholic Church, January 1st is the Solemnity of Mary, the Mother of God. Many are not comfortable calling Jesus' mother, the Mother of God. Dr. Marcellino D'Ambrosi has an interesting article titled, Mary, Mother of God?, which discusses how this title of our Blessed Mother came to be and the history behind it. I always enjoy attending Mass on New Years Day as a family to set the new year off right. We went to the vigil Mass tonight at 5 PM since we knew we would be out late ringing in the new year with friends. So we played Wii games with 2 other families and then rang in the new year with glasses of champagne and the kids had sparkling grape juice (out of real wine glasses!) :) They loved it! This weekend our homeschool group will have our annual Epiphany party. We have a get together after the Christmas rush and it's nice to come together in fun and fellowship just before the second half of our school year begins. I'll be bringing the frankincense and myrrh that Anna-Marie at Life's Adventures posted about and then she sent me some in the mail. I look forward to bringing these nativity gifts to our Epiphany party! Thank you Anna-Marie for your thoughtfulness! For a great article about the Epiphany feast day be sure to read The Epiphany Revealed! May you have a blessed 2012! Sounds like such a fun night! We had a good time bowling at our local alley's Family New Year's Eve party and then came home to games and some fun before ringing in 2012. An Epiphany party sounds wonderful! I am hoping to find a good Catholic homeschooling group so we can take part in celebrations like that. I look forward to seeing if you post photos. 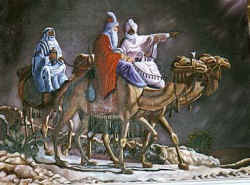 How awesome that you are bringing the gifts of the wisemen! Happy Feast Day of our Lady and Happy New Year! May God bless us all with much love, health, and happiness in 2012! New Years Blessings, Tracy! How fun to have a homeschool party to celebrate the Epiphany:). Ave Maria! Thanks ladies for stopping in and leaving such kind comments! Hope to post Epiphany party pictures after this weekend's celebration! Happy New Year to all! Happy New Year! Thanks for grabbing my button (again)! I changed yours out also on my blog to your new one!